Hola! Whether you know how to speak Spanish or not, it’s probably a word you’re familiar with. It’s a greeting that’s commonly used by over 470 million native Spanish speakers around the world. With nearly 10% of the population speaking this beautiful language, Spanish is the top 3 most spoken language in the world. Here’s a map illustrating the 21 international countries that uses Spanish as their official language. However, don’t let the beauty and natural flow of the language fool you into its simplicity of how to speak Spanish. The origins of Spanish as a language originated back in the fifth century. Over the next thousand years, the language expanded into several different countries including The Americas, Africa, and the pacific. With the international expansion, the language was influenced and accepted loan words (also known as lexical borrowing) from the pre-Roman languages, Greek, Germanic languages, neighboring Romance languages, and even English. This is why there are over a thousand words in Spanish very similar to the other Romance languages, such as Portuguese, Italian, and French. In addition to the influences that Spanish received in its early stages, you’ll also find that nearly every Spanish-speaking country has formed their own style and dialect. Just like how English from Britain is quite distinguishable from American English, the Spanish spoken in Buenos Aires is very different from the Spanish spoken in Spain. In fact, it’s not uncommon to witness a Colombian and a Mexican misinterpreting each other during conversation. Now that we understand the brief history and differences that exist in Spanish, let’s talk about the benefits you’ll reap when you learn how to speak Spanish. The benefits of learning a language is clear, and we’ve written an extensive post explaining the core benefits of language learning here. In this complete guide, we wanted to be more specific by sharing the benefits of knowing how to speak Spanish. Here are the three main ones we’ll share. When people think of a language that’s the most widely spoken, they will normally say Mandarin. How many times have we heard, “China is taking over the world!” by politicians and journalists. While there are over 1.1 billion Mandarin speakers around the world, the complexity and difficulties of learning the language may not be worth the reach. Learning expert Scott H. Young states that learning how to speak Mandarin is not only harder than learning how to speak Spanish for beginners, but it is fundamentally different. Everything from the tones, vocabulary, and character is vastly unique compared to the latin languages, and the learning curve would be quite steep. While learning Spanish for beginners from English is like going from playing water polo to handball, learning Mandarin from English is like going from playing golf to skiing. In fact, it‘s not an exaggeration to claim that reaching fluency in speaking, writing, and reading in Mandarin will take 4x more effort and time than learning how to speak Spanish. Apart from China, many of the fastest growing economies in the world, such as Mexico and South America, use Spanish as their official language. Not to mention, it’s the second official language in the United States, with over 45 million people who know how to speak Spanish as their first or second language. In terms of global purchasing power, the combined GDP of Spanish-speaking countries total to over $6 trillion, with Mexico and Spain alone totalling $1.68 trillion and $1.43 trillion respectively. The economic power of these countries will only continue to increase by second, and it’s why global corporations like PepsiCo are investing over $5 billion into Mexico alone. Knowing Spanish is quickly becoming a standard for many corporations doing business with Spanish-speaking countries, not just a “nice-to-have” skill. As the world continues to become more globalized, there’s no question that Spanish will become as mandatory as knowing how to use Microsoft Word. The last and main advantage of learning how to speak Spanish, is that it’s incredibly transferable to other languages. This is great news for polyglots who have desires to learn not just Spanish, but French, Italian, German, Portuguese, or other languages originating from the latin root. A study mapping the flow of information online found that the languages that reach the most linguistically diverse readership tend to be the ones most connected by multilingual speakers. In order, they were English, Spanish, French, and German (notice how Mandarin is not on this list). Spanish is not only transferable to other languages, but it contains many of the same words in several languages, including English. Take a look at just some of the many words that cross-over between English and Spanish. Hopefully we’ve been able to show you the major advantages of knowing Spanish for beginners versus other popular languages like Mandarin, and what the core benefits are. We assure you there are many more benefits to learning Spanish that we didn’t mention here, but now we need to outline the core steps you need to take if you want to learn how to speak Spanish. As we wrote in our post on achieving any goals in life, setting a goal for the sake of it is rarely sustainable, because you will inevitably lose motivation. Simon Sinek, who’s the bestselling author of Start With Why, calls this The Golden Circle. After studying hundreds of the world’s greatest leaders, he recognized that the most powerful way these leaders inspire lasting action is to understand the purpose behind why you’re doing something. The next time things get hard, you’ll always be able to come back to these questions, and remind yourself the purpose behind why you’re learning how to speak Spanish. If we want to achieve our language goals, we need to schedule them. This applies to not only language learning, but with anything we want to achieve in our lives. Upon researching the successful habits of over 200 billionaires, Olympic athletes, and entrepreneurs, Kevin Kruse reported that none of them used a to-do list. Doesn’t account for time. When we have a long list of tasks, we tend to tackle those that can be completed quickly in a few minutes, leaving the longer items left undone. Research from the company iDoneThis indicates that 41% of all to-do list items are never completed! As we want to get the things we want done, despite our busy schedules, we need to block off personal time on our calendar and dedicate our focus to it. Otherwise, it’s easier than ever to be distracted by the millions of other things trying to compete for our attention. Applying this to learning how to speak Spanish, we have to determine whats the “ONE method” of language learning that we can use such that by doing it, everything else will be easier or unnecessary. The problem with this is that with your busy schedule, you have too many options to choose from, causing analysis paralysis. Many studies have shown that analysis paralysis is one of the #1 causes of procrastination. Focusing on only one important task, and dedicating time in your day to move it forward can significantly increase your effectiveness. If your #1 goal is learning how to speak Spanish, then it’s safe to say that you should choose a learning method that allows you to get as much speaking practice and help as possible, right? Now whether you decide to go with an online platform like Rype or a conversation exchange/language exchange, depends on how much time and patience you have to find the right partner for you. We’ve written all about the pros and cons of using a conversation exchange. Who says that you need to travel to a foreign country to immerse yourself in Spanish? With savvy strategies and techniques, you can immerse yourself at the comforts of your own home. A powerful way to immerse yourself at home (and one that is super easy to do) is to label individual items at your house with a sticky note and a sharpie pen. Everything from plates, stove, window, desk, computer, etc. Start with a dozen or two items that you most often use (this way you’re learning as you use it), and continue to build on them as you learn more Spanish words. Start by making a list of all the information you absorb throughout the day, from the moment you wake up to hitting the sheets for bed time. Forcing yourself to do something you don’t enjoy is one of the fastest ways we’ll stop persisting our learning journey, because our brain will associate the foreign language with negative associations, rather than positive ones. Language is learned with people, and used with people. This means that immersion in language learning doesn’t happen alone, nor does it happen through algorithms. Using the abundance of resources online, you’re able to find people that you can practice Spanish with. This could be through a conversation exchange, an accountability partner online, or a Rype coach that’s dedicated to supporting you each step. Just make sure that no matter who you find, you’re able to set up a consistent schedule that allows you to get a steady flow of speaking practice throughout the week, instead of practicing in waves (on and off). In anything we do in life, there are a few key actions, tasks, and moments, that will have the biggest impact in the end results. This concept of minimal input and maximum output is what the Pareto’s Principle represents, stating that 80% of our desired output comes from 20% of our inputs. 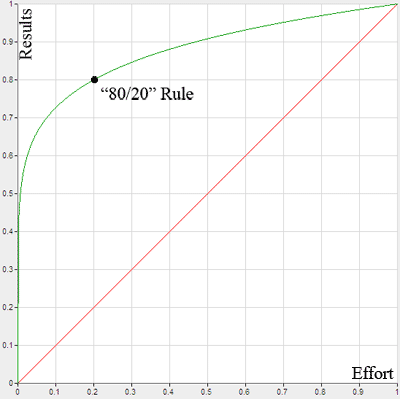 While the exact ratio is up for debate, you can use the logical concept of this theory to conclude that we should focus as much as we can on the 20% of effort that brings 80% of our results. For language learning, this can be done by focusing on learning the most common words. Many of us begin our language learning journey, only to waste hours of time learning words that we will either never or rarely use. It’s very unlikely that we’ll ever need to know how to say “aardvark” or “idiosyncratic” in Spanish (think about how often you use this in your everyday conversation in your English!). You’ll be surprised how far you can manage a friendly conversation with very little words, by solely understanding the context of what’s happening around you, and through non-verbal communication. How many words should we learn? Studying the first 1000 most frequently used words in the language will familiarize you with 87.8% of vocabulary in oral speech. Studying the 2000 most frequently used words will familiarize you with 92.7% of vocabulary in oral speech. And studying the 3000 most frequently used words will familiarize you with 94.0% of vocabulary in oral speech. Without throwing too much research at you, these findings brings us to a simple conclusion that can save you a lot of time. In fact, taking the leap from 2,000 to 3,000 most frequently used words will only provide us only an additional 1.3% knowledge (92.7% –> 94%), which is significantly marginal to achieving our desired results. It’s fair to say that while investing our time to learn the first 2,000 gives us a great return on our time. Whatever goal you have in life – health, love, business – having a coach can not only guarantee you reach your goal, but it will accelerate your goal. This is why the top-performers in any aspect of life, pay tens of thousands (sometimes millions) of dollars to have a dedicated coach that works with them. It makes sense because having a coach saves them years of struggle and has a direct return on accelerating their achievements. Like learning how to perfect your golf swing, or starting your own business, the only way to get better at these skills is to learn by doing. Language learning is no different. But while you can perfect your swing or start a successful business without relying on another person, it doesn’t apply in language learning. This is because languages are specifically designed for communicating with other people. Without a coach or accountability partner to converse with, it’s like trying to play frisbee by yourself. Research from NTL Institute Organization shows that immediate immersion is by far the most effective way for humans to learn anything. If you compare the retention of information between immediate immersion and the traditional (and the most mainstream) way of learning languages, such as school lectures or books, the differences are remarkable. This means that 90-95% of everything learned through these methods go through one ear and out the other, and that learning through immersion is up to 18x more effective than learning through classroom lectures. The reason why most of us have not achieved everything we want in this world, whether it be finances, language acquisition, love, health, etc. is not because of lack of talent or resources. It’s because we quit too early. 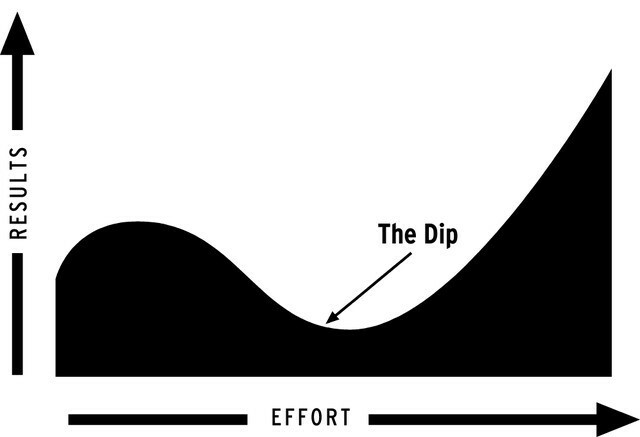 This “dip” due to lack of motivation is something all of us go through several times in the process of mastery — even the best performers in the world. We all experience a high of energy and excitement when we first start to learn something new. This is the natural part of the “honeymoon” phase. Without a coach or someone there to guide you, most of us go through the emotions of uncertainty all the way down to acceptance mode. This is when we decide to quit. Since most of us rely on learning how to speak Spanish through methods that require very little interaction and accountability, we never get through these dips. It’s no wonder why so many of us have started to learn a new language, with zero results (and hundreds of dollars down the pipe drain). Having a coach or teacher empowers learners to not only overcome the dip when you most need it, but to maximize the result when you’re getting in the next hump. Here’s the graph of the “Training Effect” in action. Notice how the lowest point of the next dip is higher than your previous high point. The key is not to avoid these inevitable low points in our learning process. It’s about having someone there to support you through it quicker and faster. Why do people quit diets or workout routine, and never pick it back up? Because there’s no penalty, there’s no cost. You don’t get fired from your job if you quit your diet. In fact, there is no tangible loss that you will face in the immediate future. So you quit. b. Discover your trigger points: We all have moments when we say, “ah screw it.. I quit,” also known as the “What The Hell” effect. The key is to discover when we have those trigger points and what those trigger points are. If you follow these 7 essential steps and stick with it, we promise that you will learn how to speak Spanish over time. 1. Know your “why” – Learning a language must start with discovering the purpose behind why you’re doing it. Traveling, career opportunities, family, etc. 2. Schedule your learning – What’s not on your schedule, won’t get done. Instead of letting unexpected distractions control what we do, we must schedule our priorities on the calendar. 3. Discover your “ONE Thing” – What’s the ONE resources you can use to learn how to speak Spanish, such that if used properly, everything else will become easier or unnecessary? 4. Immerse yourself at home – Without changing your day to day routines, switch the information you’re absorbing into Spanish. 5. Learn the most common words (80/20 Pareto’s Law) – Learn 2,000 of the most common Spanish words, which will familiarize yourself with 92.7% of the language. 6. Have a coach – Learn up to 18x faster by immediately immersing yourself with someone that can help you practice and give you immediate feedback along the way. 7. Go Long – Embrace the low dips in your learning process, and find an accountability partner that can help you push through the tough times. Learning a language is not just about the driver itself, but it’s just as much about the vehicle you’re driving. While you are in full control as the driver, we can give you the best vehicle to help you reach your goals in Spanish faster. If you’re ready to learn how to speak Spanish, we encourage you to try Rype for free today. You’ll instantly get 3 free lessons with 3 different coaches when you join — our treat.